In both Asia and Africa, the elephant is known for many qualities. As the largest extant land animal on Earth, the elephant is known for its strength an constitution. Its emotional qualities define it as a compassionate and gentle creature. 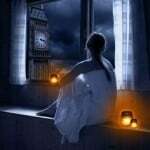 Intellectually, it is known for its wisdom and memory. It is known throughout the spiritual world for a variety of reasons. It is known as a delicate reminder of how human greed and lust for ornaments can cause great suffering in the animal world. It holds many meanings to a wide variety of people and cultures. What follows is a description of this noble and hunted animal. The elephant has the power to snap a tree in half without exertion. Its hide is strong enough that tigers and other predators can not penetrate it. Its tusks can move earth with the ease of a machine. Its sheer weight can crush a car without exertion. The elephant is a clear indication of strength, constitution and sheer power. People may choose the elephant to describe their own physical prowess. This symbol can be seen on bodybuilders and other athletes. Elephants are caring and loving creatures. Their offspring are cared for better than most animals in the world, humans included. Young elephants are raised in communal organizations of female elephants. 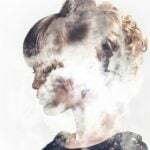 This matriarchal structure establishes compassion and community in such a manner than the youth are cared for by each elephant, not just their mother. Elephants are one of the most intelligent creatures on earth. Known for their memory, the saying ‘an elephant never forgets’ is established in English speaking cultures around the world. Because of their age and countenance, the elephant is described as being a creature of wisdom. In practical terms, the elephant has the intelligence to be trained as a beast of burden, is seen in circuses, and used as a tool of war. However, it should be mentioned that times are changing, and humanity is realizing that all animals deserve to be treated with respect, not abuse. Ganesha, one of the five main gods of Hindu faith, is depicted as a divine being with the head of an elephant. The patron god of science, luck, success and removing obstacles, Ganesha is revered by millions of people around the world. In the Tibetan foundation myth, the elephant was involved in the creation of the universe. The elephant takes the role of Atlas as well, though rather than holding up the sky, the elephant holds up the universe. In some Buddhist traditions, the elephant is viewed as a sacred animal. Elephants are found in many other cultures as well throughout their spiritual teachings. In some cultures, the elephant is known as a symbol of fertility. Because of their size and strength, the elephant is generally known as a symbol of male fertility and sexuality. During mating season, the males can become intensely aggressive and violent. Sexual relations between male and female elephants can be powerful scenes of intimate expression. Such is their fame that – regrettably – the ivory of elephants and rhinoceroses are poached for the use of libido increasing supplements in many cultures. The elephant is known for living an incredibly long time. Cultures around the world have viewed the elephant as a symbol of immortality and longevity. Few creatures live longer than the elephant, and elephants have been known to have been owned by three generations of royal families, though potentially even four or five generations. Compounded with their spiritual representations, it is easy to understand why Greeks and Romans would view the elephant as a symbol of immortality and longevity. An elephant submerged in a pool or spraying water into the air is a natural rendition of the elephant. The elephant, often covered in mud or dust, is a perfect symbol of earth. 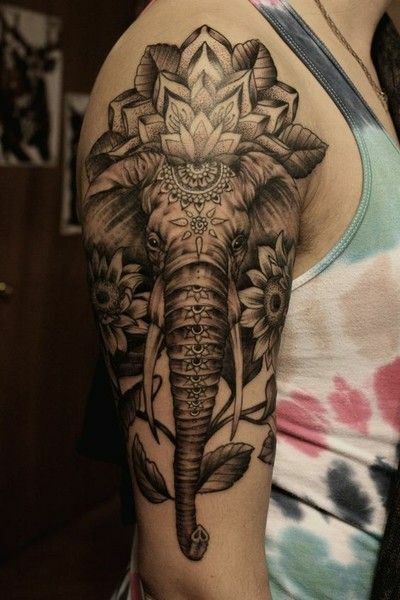 Though elephants hold no love for fire, your tattoo has no reason to stick to reality. Give your elephant control of fire, perhaps by giving it a blazing aura of divine light. Some cultures associate elephants with the clouds, as elephants are occasionally depicted as riding steeds made from clouds throughout the sky. Play with light and shadow to see how you can depict balance in the shading of your elephant. Africa, Indian and Southeast Asia all have countless depictions of elephants. Perhaps it would be beneficial to study those artistic renditions before you decide on your tattoo. African elephants are different than Asian elephants. A dazzling sun over the open savanna in African artistic style could be the perfect backdrop to a line of marching elephants holding the tail in front of them. A shady and lively jungle could be home to a wallowing bull elephant. 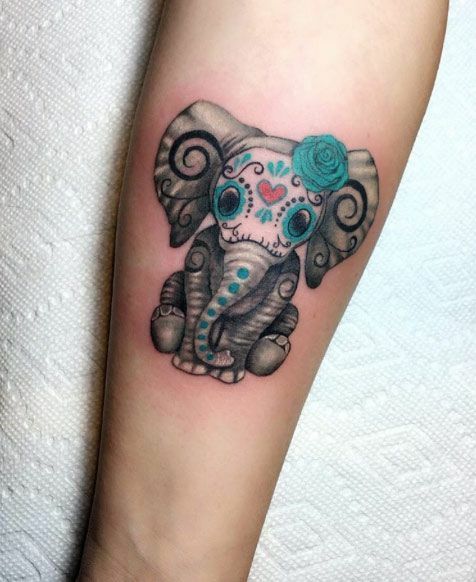 Give your elephant tattoo a touch of your own personality. For someone fond of earrings and other jewelry, decorate your elephant to your heart’s desire. A family of elephants with their own personal touches can reveal your love for your own family. Reflect your spirituality by creating a portrait of an elephant becoming enlightened at the base of a solitary tree at the top of a rocky cliff. 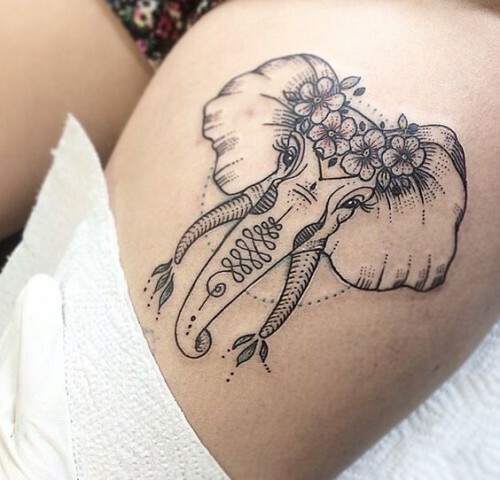 By adding your own personal touches, you can make your elephant tattoo have a unique meaning all your own. Expand your mind as you decide what tattoo you want to add to your collection of body art. 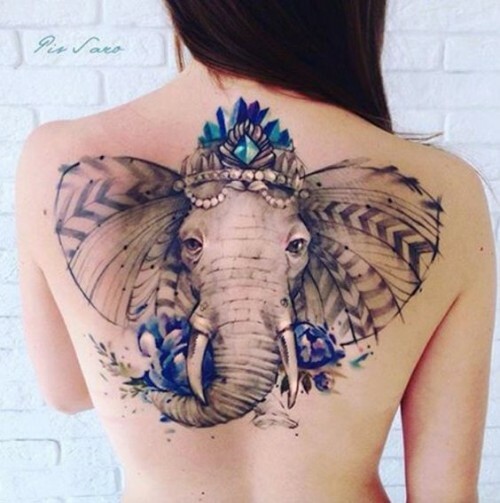 The elephant’s role in culture, history, spirituality and natural processes make it an excellent choice for anyone interested in getting a tattoo. 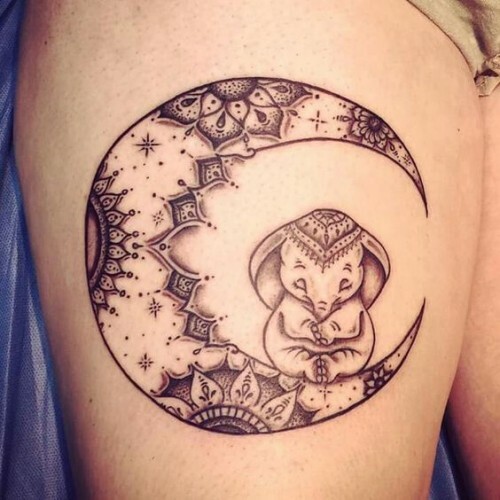 Be certain to appreciate your tattoo artist’s advice, as they will have years of experience and insights that can help you design your tattoo.